Last night was my first chance to really compare the PVS-7 and Mod3 WP filmless side-by-side. See how well an 80mm f/6 APO serves as a night vision grab & go scope. This includes optical performance (image scale, brightness) as well as overall ergonomics. Finally see the Andromeda Galaxy with magnification and amplification. I only got into NV back in May, and actually haven't managed to look at M31 yet with NV in a scope! Additionally, I wanted to gauge the pure, un-amplified visual performance of the Stellarvue 80mm APO. It's my first APO and it's also been 20 years since I really observed with an 80mm, so I wanted to get a feel again for instruments of this size. I don't get very many nights of observing nowadays, so when I do, I try to get a lot done! I also have a variety of accessories for the night vision stuff, which are mostly detailed in my Night Vision "purchasing guide" post here. My location is my in-laws' house in Liberty Hill, TX, halfway between downtown Austin and Canyon of the Eagles (the location of the Austin Astronomy Club's observatory and primary dark-sky site). It's a solid yellow on the dark sky map, but the dark sky map does not account for a Texas-sized high school football stadium and parking lot adjacent to our property, just a few hundred yards away towards the south. The bright-white parking lot floodlights are on all the time, because... I guess they don't want anyone stealing the football stadium? In any case, on muggy nights like last night, the glow is much worse all around, and the skies are closer to orange/red-zone. My first comparison tests were at 1x, with no filters. The view through the Mod3 is undoubtedly clearer, and although the "greenness" of the PVS-7 has never bothered me, the White Phosphor color is definitely more "natural". Looking up at the sky, both revealed a tremendous number of stars. The Milky Way was already somewhat visible with the naked eye, and with night vision, it was even more apparent, but still very ghostly because of the lack of filters. One major difference is that with the PVS-7, the level of scintillation is just what it is. But with the Mod3, I can turn down the gain, until the scintillation is just barely visible. This is a much, much more pleasant viewing experience. One thing that I noticed is that the perceptual effect is highly non-linear. That is, there is a threshold level of gain beyond which I perceive no visual benefit, just slightly more scintillation. In the viscinity of this threshold, I can dramatically change the amount of background amplification and contrast, with very small tweaks of the gain knob. This is not too surprising to me, since I am very well aware of the logarithmic response of the human visual system, but it's neat to see the effect first-hand. Throughout the night, I found myself turning down the gain to find an optimal spot on the brightness/scintillation tradeoff curve. I have two filters: a 55mm 680nm IR Filter ("Ebay $10 Chinese Special"), and the Baader Red 610nm Longpass. I bought the 55mm IR filter when I first got the PVS-7, and it's a champ. I hand-hold it in front of the PVS-7, or I can also hand-hold it inside the front of the 3x Afocal lens. Even from red-zone downtown Austin, it never fails to bring the Milky Way into sharp contrast. The only downside is that it has to be hand-held. I had hoped that the Baader 610nm would be an equivalent longpass that I can mount in the NV device. Comparing the two filters side by side, from what I could tell, they were similar in performance. The larger 680nm filter displayed somewhat more contrast, but not by too much. Although the convenience of the 610nm outweighed the increased contrast, I think that the right thing for me to do is to sell the 610nm filter, and get the Baader 685nm IR Longpass. The views through the PVS-7 and Mod3 were different, but in ways that are hard to describe. I am fortunate that the tube in my PVS-7 is pretty darn good. There are no blemishes, and the IR-filtered view of the Milky Way definitely rivals that of the Mod3. However, the white phosphor is visually more pleasant, and it's a little bit sharper and clearer. At 1x, looking at the beautiful river of light of the Milky Way, the manual gain control of the Mod3 is not really needed, because there is enough light coming in, to where the scintillation in the PVS-7 is not a problem. However, I did experiment with turning the gain down to lower levels in the Mod3, and this yielded a very, very lovely view with almost no scintillation. It's worth reiterating, yet again, just how amazing this setup is. I'm standing next to a (Texan!) high school football stadium, in Bortle 4.5 skies, and the view through the Mod3 is easily Bortle 1, with zero scintillation or other artifacts. A Mod-3 monocular, with a $10 IR filter, instantly puts all of the sky within reach. With the IR filter, so much texture is visible in Sagittarius, and the stars in the Lagoon glow as a bright fuzz-patch. The nebulosity in the dark lanes in Sagitarrius are visible, but not in great contrast. The river of the Milky Way sweeps up through Cygnus and over into Cassiopeia, where M31 hangs nearby. The visceral experience of this is what I have dreamt of in astronomy, since I was a child! Next up, after sweeping the Milky Way and taking it all in, I switch to narrowband H-alpha to survey larger nebula. The Orion 7nm H-Alpha Extra Narrowband filter has been my workhorse since I started with night vision 4 months ago. In my opinion, a narrowband filter like this is a must have accessory for night vision. In fact, if you have a Night Vision device and you don't have a narrowband filter, the most apt analogy would be like having a car and no road to drive it on. I am eager to try an even narrower at some point, but those filters are much, much more expensive. I also have a Baader 35nm interline CCD filter, and just wanted to see how it would perform. The result for night vision was basically "meh". It lacked the contrast and punch of the 7nm, and wasn't particularly useful for viewing the sky at 1x. With the narrowband filter, the background of the Milky Way fades somewhat, and the overall view gains contrast, because there is much less light coming through. However, this means that there is also more scintillation. The PVS-7 automatically cranks up the gain (to the maximum, as far as I can tell), so the result is a high-contrast view of the night sky, with the nebulae glowing like little clouds, but with sparkly scintillation speckling the view, as an artifact of night vision. As others have noted, and I can confirm, the scintillation is not a really big issue, and you quickly learn to get over it. However, that's not to say that the view wouldn't be improved if there wasn't scintillation. Once again, the gain knob on the Mod3 provides the ability to manually set this trade-off. While sweeping the sky at 1x, the PVS-7s provided their standard amazing views. But in the Mod3, I was able to turn down the gain so that while the absolutely brightness of the nebulae was lower, there was also dramatically less scintillation. In the last several months, I have absolutely gotten spoiled with the narrowband H-alpha view through my PVS-7. Seeing the Lagoon and Trifid nebulas, looking up at the North American, Pelican, and Gamma Cygni region... these are now my new "normal". But they've always had sparkly scintillation, which I'm mostly able to ignore. Snapping the 3x afocal on, I craned my neck to look directly up at various targets in Cygnus. It was spectacular. Gamma Cygnus and the dark lanes running through the subtle nebulosity there was stunning. The fragments of the Veil were beautiful... I had to stop multiple times just to rest my neck, until finally I just bit the bullet and laid down on the concrete driveway. Then I just drank it all in. At one point I couldn't find my bearings because there were just SO MANY STARS, so I ended up looking for the Veil Nebula, and sighting from there. It's really something else to be nebula-hopping instead of star-hopping! 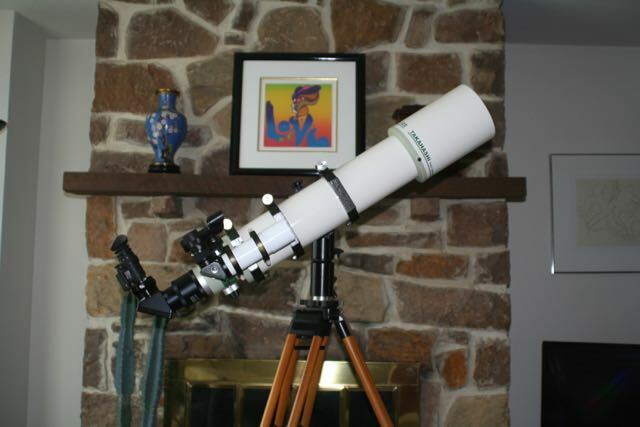 As I've mentioned in other posts, my main telescope is a Celestron 11" EdgeHD forkmount. This is a beast of a scope but it's optically amazing. I've used my PVS-7 through it several times, and been blown away each time. The photos I posted from last month's star party were taken with this C11, using Eddgie's L3 WP (I think an NVD Micro) with a 0.5x focal reducer. A big part of the appeal of night vision for me is the same reason I got turned on to EAA in general (although I don't have much experience yet with my Atik Infinity): I live in town, and I have a very busy life including young children, so I can't do 2 hour drives out to dark sites. In the same vein of the photographers' mantra about the "best camera" being the one that you have with you, the "best optics" for me are the ones that I can actually go and use on a regular basis. So, the portability of the telescope is a big component of my overall hobby investment. So, I set up the refractor, dropped in the Mod3 with my ScopeStuff C-mount to 2" adapter, and immediately noticed a small inconvenience: when screwed in all the way, the adapter presses against the gain control knob. It's not a problem, but it does mean that I will probably use the 1.25" adapter more often in the future. With the scope, I primarily wanted to check out the major nebula highlights. The first thing I looked at was the Lagoon and Trifid nebulas. Since I wasn't "digiscoping", my field of view was dictated by just the Mod3 itself, and the image scale was a good one to sweep this part of the Milky Way. The attached photo, taken with my iPhone, shows the composition. The default views in the PVS-7 and the Mod3 are not too dissimilar, although as always, the Mod3 is just somewhat sharper, and I find the bluish-white tint visually more pleasing, because it's closer to the grayscale I'm used to observing. I looked at the Lagoon, the Trifid, the Swan, the Eagle, the North American, the Pelican, the Pacman, the Veil, the Garnet Star nebulas. Just visually sighting down the tube, then looking through the Mod3 and sweeping through the stars until I find the nebula. This is deep-sky observing as it should be! One unexpected result, however, was that since I have gotten spoiled with the Goto features of my CPC1100, I had to actually work a bit to find particular objects. This is where having the PVS-7 out, in conjunction with the Mod3 in the telescope, was a nice combination. Unfortunately I had to keep swapping the narrowband filter out between the two, but that's a very minor complaint. I'm just going to have to order another one! 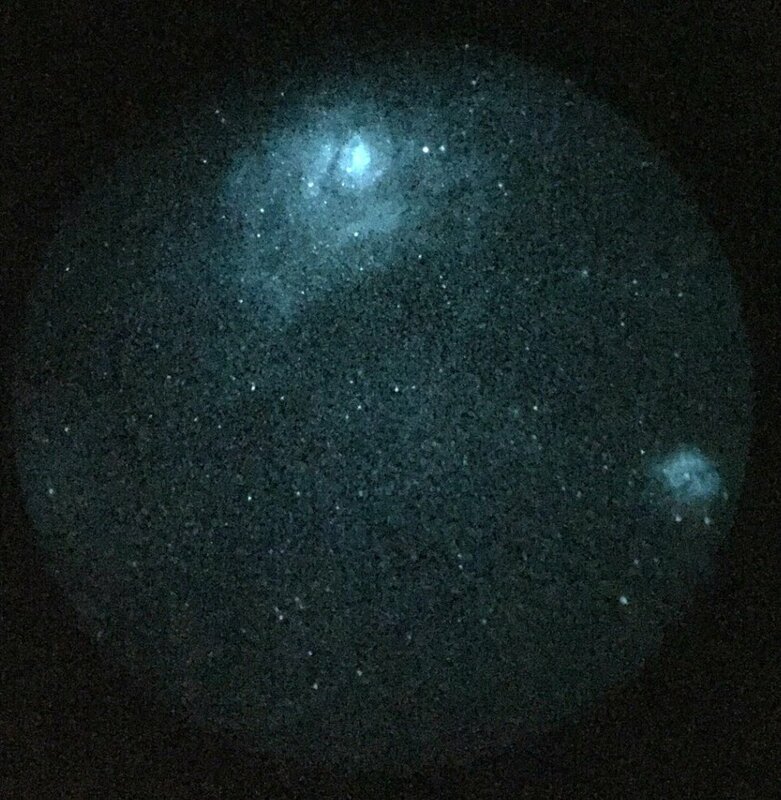 I wanted to see the Andromeda Galaxy with night vision, but I didn't need the H-alpha for that. I wanted some kind filter, however, to cut out the skyglow and light pollution. I decided to use a 2" Lumicon UHC. In retrospect, I probably should have used the Lumicon Deep Sky filter for general viewing. The Andromeda Galaxy itself was very nice. I couldn't see much structure, but after turning down the gain to reduce scintillation, I could use averted vision and see M32. In the past, I've been able to do some averted vision with the PVS-7, but the scintillation makes it somewhat more challenging. I also looked at some open clusters and just kind of tooled around. There are so, so many stars out there. If you like stars and star fields, Night Vision is a great enhancement for that. I would say that the Mod3 again outshines the PVS-7 for this, but not by too much, because of the manual gain. Stars don't need too much amplification, but the PVS-7 will automatically crank the gain no matter what, so you end up with unnecessarily high scintillation. I really wish I could figure out a better way to capture the in-person experience of night vision for people. As anyone can tell see, the photos that we tend to share, hastily taken with hand-held smartphones, are grainy and are compounded by bad JPEG artifacts and digital camera noise. They are terrible compared to even the worst CCD or DSLR photos, and really don't do the NV devices justice. Now, part of the issue is that when I've got my NV tube in the eyepiece, I don't give a rip what the photos look like, because I'm too busy oggling the view! But I think that as advocates of this technology, we could do a better job if only we could figure out better ways to photograph (and therefore convey) our experience. As a final task for the night, I decided to go to a regular eyepiece. I dropped in my 14mm Delos, and looked at Albireo, one of the loveliest summer stars. The optical quality of the Stellarvue refractor was very satisfactory. The field was rich with pinpoint stars, and the orange and blue Albireo shone beautifully. I also looked back at the Sagittarius region and the Lagoon Nebula with the Delos. The view was lovely, and it was what I expected; it was as nice as can be expected for passive glass. It also starkly reminded me of how spoiled I've become now with the night vision. A thought occurred to me: 99.99% of my fellow astronomers cannot just turn a knob and pump up the brightness. This is the view they get, and will have to be content with, unless they buy a huge light bucket dob, or drive hours away from civilization.. and even then, it's not clear to me that the view will be comparable to what I'm seeing in the Mod3. Of course, if I were to drop the Mod3 into a huge light bucket several hours away from civilization, I'm sure the views would be more amazing still! One of the things that got me excited last night, standing next to a scope that's barely larger than my very first Criterion refractor (75mm), was that night vision has really unlocked the stars for me. There is just so much to look at in the night sky, when every night can be turned into a dark sky with just the flip of a switch. The star maps no longer feel like a "catalogue of things you could be looking at", just taunting me, and are now instead a catalogue of things I'd like to see and can actually see. Secondly, although the Mod3 outperforms the PVS-7 in many respects, and the manual gain control is a crucial feature, the PVS-7 is a fabulous device. (I'm especially lucky in that I got a good tube, and I can confirm that now that I can put it side-by-side against my much more expensive L3 filmless.) I would be happy with just it alone for a long time. However, now that I've experienced the additional dimension of viewing experience available with manual gain control, I think that I will just use the PVS-7 for high-brightness situations (1x, 3x with IR filters, and clusters with Deep Sky filter). For low-brightness H-alpha viewing, that will clearly be the domain of the Mod3. Hold up the NV to eyepieces, to zoom in more on some kinds of objects. The 480mm focal length is definitely too short for some things I'd like to get better looks at, including galaxies and whatnot. Get a more effective workflow going in terms of observing session planning, now that I can actually see lots of stuff! Edited by pwang99, 04 September 2016 - 08:58 PM. Great write-up. It mirrors some of my early experiences. Some differences too. Gain control very much worth it! Using it a lot more than I thought I would. In addition to fine-tuning to balance brightness and scintillation, you can turn it down to approximate a conventional eyepiece view for comparative purposes. It can be turned down to almost a black field, and stars can be brought in a little bit at a time too. I have only two filters, a 650 long-pass and H-a 12nm. Most of my viewing (actually almost all) has been along the Milky Way, 1x and 3x. I find myself relying on the H-a very heavily. I'm sure it will change once I start getting off the galactic plane. Interesting comments on the M2 mount. I was contemplating getting one now that my AVX mount became surplus. Guess I'll hold on that thought for awhile. The skies from my home have gotten noticeably worse over the 11 years I have lived in this neighborhood. Bortle 5, maybe a little better when the nearby softball and soccer stadiums go dark. Yet with NV I can trace the Milky Way virtually to the horizon. Of course overhead is much more rewarding, Cygnus is just mesmerizing now. Even at 3x I can see much of the detail plotted on the Gamma Cygni and North American Nebula detail charts of Uranometria. Amazing! Edited by Jeff Morgan, 04 September 2016 - 08:23 PM. What am I not going to say now? Hmm? Paul, I'm meant in response to Jeff's "Amazing"
Four words beginning with "I" and ending with "told you so"
Great write up. Im outside now on another clear but humid, low transparency night. Playing with 640 longpass, 35nm H-a, 6nm H-a (new) , and B+W 093 infrared. Paul, keep experimenting and find what you like best! OK, managed to get out again tonight. Things started out sketchy as heck, with multiple layers of clouds all blowing through. Around 10pm or 10:30pm, things cleared up and the whole sky was wide open. I was doing an impromptu sky tour to a relative, so I didn't get as much focused time on knocking items off my observation list, but it was worth it just to hear her gasp when she finally was able to see Cygnus in H-alpha. Clusters are dynamite with the manual gain control. Stars don't need a whole lot of boosting, and being able to keep the scintillation down makes for a massively more aesthically pleasing experience. Now that I knew to use the PVS-7 as a guide/spotting NV device, I could eyeball sight most of my targets. The red-dot finder that came with the 80mm is out of batteries, so I didn't have a real finder I could use. I tried holding the Mod3 up to a view through the Delos, but this was very faint for some reason. I'll need to fiddle with this more because I recall that Eddgie was able to do this with the Micro to good effect on my C11. A lot of shooting stars tonight. Both of my observing companions saw several, and I saw a few. Tail end of Perseids or something? The Lumicon Deep Sky filter is more fit for NV "general tooling around" than the UHC filter. 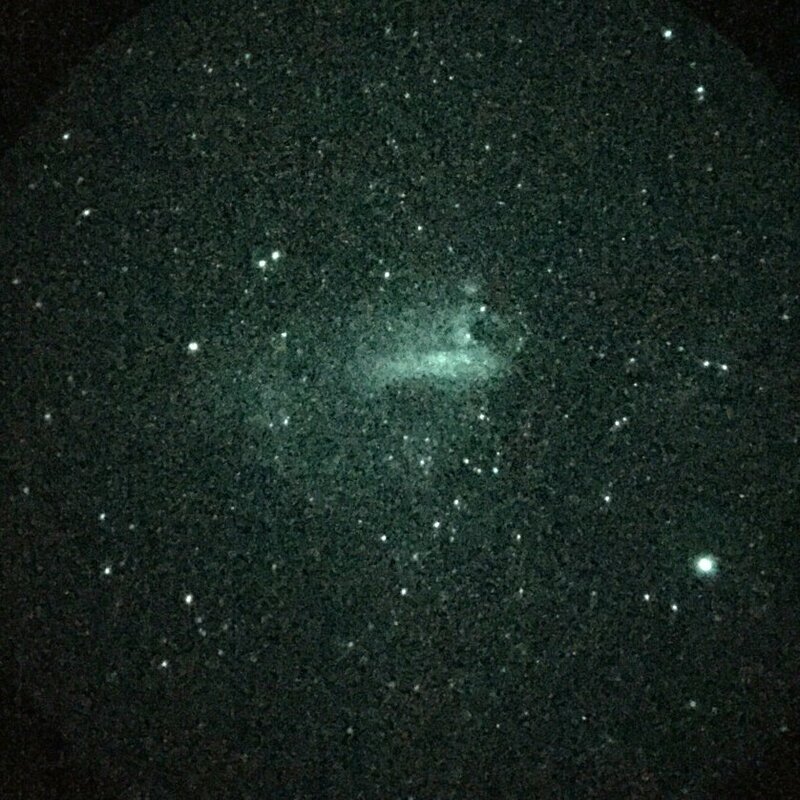 With the Deep Sky filter, looking at the Andromeda Galaxy again tonight, I was able to observe M32 easily with direct vision. I was frustrated not being able to locate the Veil in my scope tonight, because it was right at zenith, which made working with the alt-az refractor quite awkward. I'm not sure what came over me, but I decided to unmount the 80mm APO and just hand-hold it. It wasn't too heavy (but it definitely wasn't that light! ), and then I was able to find the Veil pretty quickly. I saw that the Big Dipper was setting, so turned the scope horizontal in my arms so I could take a look at Alcor and Mizar. It turns that that some kind of satellite was passing by them *right then*, and I was able to track that a little while, hand-holding the 80mm refractor. It's not a *bad* mount by any means. High quality build, etc. etc. It's a little unfortunate that it lacks fine control knobs of any sort. The main problem is that I've gotten spoiled with the GoTo features on my CPC1100, and since I can see so many more things now, it's much more productive for me to have GoTo. Now, that being said, I definitely want to have the ability to disengage the drive and move the scope around, because sweeping around looking for stuff is a lot of fun! Very nice report. The Lumicon Night Sky H-Alpha is a great Milky Way sweeping filter in heavy lp. Manual gain is awesome for turning down. This is why I have the two gen 3 PVS-4's. One biocular, one monocular. Wide view, less noise with gain down. Just down a hair to still get plenty of boost, but removing the majority of scintillation. I use my 120ST on a Vanguard 40lb capacity tripod with geared center column and a M2 mount. I love the M2 mount. Whole weight of 120ST setup on tripod with M2 is about 25lbs. Walked that three blocks to a star party with a small pelican case in my other hand with nvd micro and some filters in the case. Scope/tripod slung over my shoulder. It was pretty easy and definitely fits my grab n go criteria. 99.99% of the time I am just taking it down a couple steps to the back deck. Adjustable observing chair too. Between the chair adjustment and geared center column adjustments, its easy to be comfortable viewing with the short refractors. I just use the M2 handle to steer and it's pretty smooth after balancing. No need for tightening up much when balanced. T-Rex has slo-mo handles which are nice. Particularly when the load is a little unbalanced and clutch locks tight, just use the slo-mo controls to move it. I have always used manual alt-az mounts. Tried a GEM when I attempted imaging and never caught on to liking it. I also do not use finders on my scopes and haven't since my first dob when I first started in the hobby. If you are used to goto, I can imagine manual alt-az is a little bit of learning curve. I mix it up with my iphone apps giving me general area and size/apparent brightness, then point my scope in the area and start doing cornrow hunting. Things pop pretty good with narrowband and NV, so target aquisition usually doesn't take too long. Sometimes I just find stuff and identify after too. Here is my Night Vision experience so far. Hope this adds to the information presented. I live in a Gray/White zone with “heavy” light pollution just outside of Philadelphia. 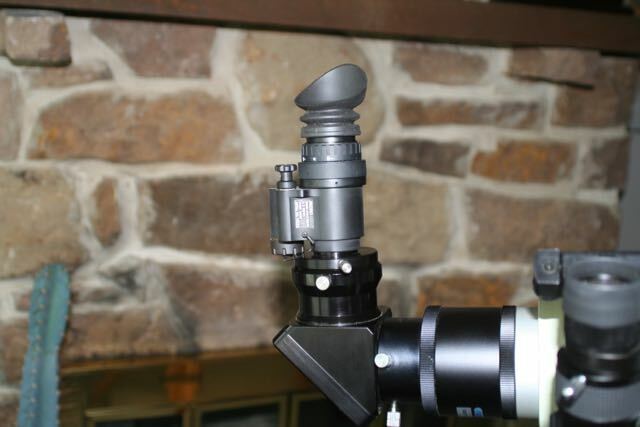 To date, all scopes were used on alt/az mounts. With my NVD Micro, I have found the 685 pass deep red is really great for knocking down heavy light pollution and is better than the 610 from this heavily light polluted location; and with any of the above scopes. I also use a 7nm Ha filter and it works great with all the above scopes. I don’t really use the Mewlon for emission nebula so I don’t use the Ha filter on that scope. I do use the 685 with the Mewlon for globulars and small stuff. With the refractors, and from this light polluted location, the 685 filter “easily” shows the dark nebula through Sagittarius. Stars fields are very sharp – fantastic views! The 685 is also killer on gobulars with the Tak 120 and Mewlon 210 delivering “extremely” sharp stars and even at around 35 power in the refactor smaller globulars like M28 are resolved into pinpoints with the Micro’s brighter intensified view. Seeing these smaller globulars resolved at lower powers and imbedded in the thick star fields of the Milky Way delivers a contextual view unlike any other. Globulars in the Mewlon with its longer FL and larger image scale are also killer with the 685. Scintillation is a little more evident but who cares! The views are that good. M22 explodes in the eyepiece, as the Micro adds more unseen stars to the view! The 7 Ha filter works magic on emission nebula with the refactors producing views on some nebula that rival film images from a few years ago and making once difficult objects like the large arc in the veil an “easy” target that fills the field of view! The only addition I might add is a 6nm or 5nm Ha filter (with my extreme light pollution) but I don’t feel the urgency with the 7nm Ha. Do I love image intensified viewing from my light polluted location – YES! The Micro with the above has delivered some of the best views in nearly 40 years of observing from this location. Below is my Tak 120 on a UA alt/az mount with the Night Vision Micro. A very nice report to use! Same story for me. Having the most fun ever in my 40 years of observing. I agree with you that while I have indeed enjoyed seeing many of the bigger clusters close up with the C14, seeing them even in the Comet Catcher adds a level of context that is totally lost when using big scopes. Seeing many of these targets surrounded by a hyper rich field of stars re-frames them in the way that putting an extra 10 arc minutes around them by using a 100 degree eyepiece rather than an 82 degree eyepiece totally fails to do! I think that this is why we live so easily with the narrow apparent field of the NV dear. We see the object not framed by a little round black sky around them, but rather set in a dazzling field that can be filthy rich with stars and even the field itself can have structure that we would never see using a big scope! In a different forum, some guy was really wanting to go from his current dob to a 20" dob. I think Mel has it right. These days, I think I would be far more inclined to buy a very small, very fast reflector than I would be to buying a 20" scope. (And this is true with or without NV.. I am loving really rich field viewing these days). There are so many things out there that just look so much more beautiful when seen in a big field that it has changed my view of what makes for fun astronomy. Of course I also mentioned coupling the small, fast scope to NV, but I have to say that I don't think I could ever go back to using scopes with very small fields of view. You can put a 100 degree eyepiece in it and make a small apparent field into a bigger apparent field, but if the true field is still to small to see the entire target (something we all know now is that really big targets are super-common) it is not going to be as pretty to see as you can get using a smaller, faster scope with a much wider true field. And of course if you stick in an image intensifier, you get a miracle. Edited by Eddgie, 05 September 2016 - 09:06 AM. When I first read about "digiscoping" it sounded like the Silver Bullet - image scale with no penalties. But Glenn LeDrew posted an explanation of this recently in the thread "observations on an adjustable-magnification night vision setup". No free lunch. Shooting through the eyepiece is in effect using a barlow. The amplification is equal to the NV focal length divided by eyepiece focal length. Your effective focal ratio is increasing by doing this. View gets dimmer. 3) Amplification factor was large - 3.25x at the top range. The f/8.5 refractor I used was operating between f/9.2 and f/27.6. Note that part of that was a self-inflicted wound. In a faster scope, the effective focal ratios would be a little more practical. All things considered, I am going to try standard barlows of a lower amplification factor. One that interests me a lot is the Brandon Magic Barlow. Essentially, it is just the achromat is a short cell that threads onto the end of the NV device using standard filter threads. Amplification factor is a lot milder - 1.25x or 1.5x. If you elect to use the filter between the NV tube and the barlow, my guess is the filter would act as a spacer and increase the magnification somewhat. Well, I've only had a GoTo scope the last year, but it's spoiled me a bit. In my past, I've almost exclusively used a Telrad, because finderscopes have been so useless, whether in the local club's loaner scopes that I was using, or in the cheap Chinese achromat that I bought. (The finder that came with the C11 is pretty decent, and actually I haven't even stuck a Telrad base on the C11 yet.) Until I got Night Vision, the GoTo was a huge timesaver and almost a necessity for in-city casual astronomy, because I can't see anything well enough to effectively star-hop, especially with the longer focal length of the 11" f/10. But Night Vision changes this dynamic, as well. Since I have two NV devices, I can use one as the eyepiece, and use the other for sighting and starhopping. This makes the Telrad quite viable again, even in city skies. So now I can get back to practicing the art of visual astronomy, and really learn my way around the sky again! My comment about researching an alternative to the M2 is also partly because I'd like to have that capability for star parties and outreach kinds of events. Given the portability of this setup, and given the nerd density in Austin, I should be able to do more effective outreach if I have a GoTo capability on this refractor. At public viewing events, a tracking mount is almost a must-have, otherwise you're interrupting your spiel every few minutes to fiddle with re-pointing the scope. All things considered, I am going to try standard barlows of a lower amplification factor. I used my 2x Powermate quite a bit the last couple of nights, to good effect. For a few things (like the dumbbell) I wanted to get more magnification, but it would certainly be a whole lot dimmer. The "structure" comment is very accurate. On my first night with the 80mm, as I was sweeping around looking for the Omega nebula with the Mod3, I paused and turned down the gain, and I could see really subtle texture in the sky behind the various star-fields. This was a very neat and really beautiful effect. It was apparent last night as well, as I was hunting around for the Wild Duck cluster. So much nebulous texture in that whole region! I tried to get a "perfect view" of the Gamma Cygni region, but the 480mm focal length is a little too long... I think that 5x-6x would be perfect. YES! The galactic structure (star fields and dark nebula: B111 and B119a) around M11 is very interesting. There is an obvious demarcation line between some very star-rich sections that run right up next to dark nebula. Seeing a bright M11 floating in this area adds to the view! This is just “one” area opened up by Night Vision when compared to conventional viewing from my location. Using a 50mm F3.2 guide scope (and 7nm Ha filter) at about 6x the complete North American nebula fits in the field. But don’t be afraid to add image scale for detail. With the Tak 120 (at F5.25 and around 23x) the “Mexico” region in th N A Nebula shows tonal structure. I actually had my best “detailed” view of the Sadr Cygnus region last night with the Tak 120 as well. The Milky Way is unparalleled in all of the catalog of deep sky objects. It is all around us and we are a part of it. Every time I see it, it astounds me that I live in it. Great write-up pwang99. Excellent perspective on NV for astronomy. Great write up. I'd suggest using NightCap Pro for the iPhone, and using it to the full extent possible, it does have a live stack/long exposure mode. Classic Takahashi FC76 Ser. #7339-"Vera"